Today’s mask release was first unveiled at “Fresh to Death”, a group art show put together by Freehand Profit & Rosewood San Diego. 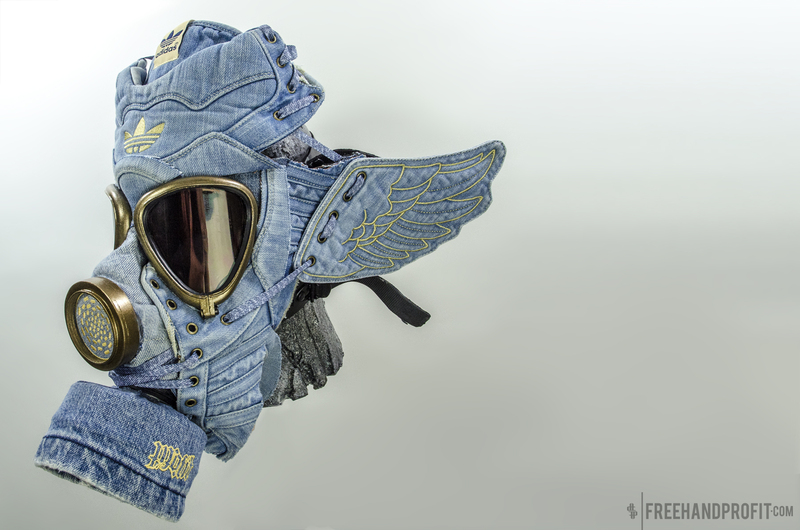 The “JS Denim Wings” mask is the 67th sneaker mask by Freehand Profit and now belongs to Rosewood San Diego, the gallery where FP also had his first solo show last year (“Rise of the Undeadstock”). Dante (@bdrowley), owner of RSWDSD (Rosewood San Diego), modeled the Adidas x JS Denim Wings Mask for the photo shoot the morning of the “Fresh to Death” opening. Absolutely jaw dropping man. Definitely one of my favorite masks that you’ve done! Your art is so inspiring & I will continue to be a huge fan.